Published on June 14, 2009 in Events. 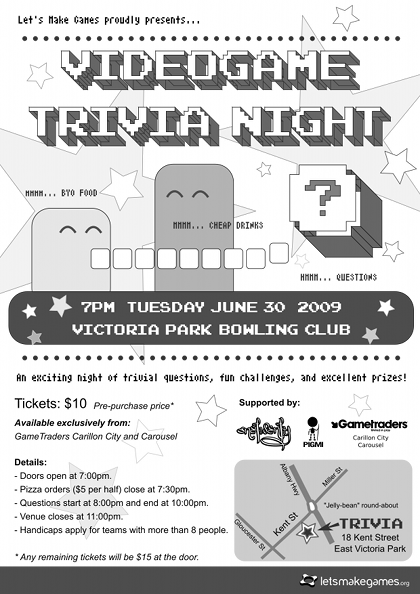 0 Comments Tags: event, flyer, gametraders, trivia, victoria park bowling club, videogame. We’re very excited to announce that Let’s Make Games June event will be a Videogame Trivia Night! Pre-purchase tickets are available now exclusively from GameTraders Carillon City and Carousel. Food: BYO food (no drinks) or order pizza ($5 per half) on the night! Get some friends together, grab a table, bring food, and have a good time! Please note that handicaps will apply for teams of more than 8 people, so try to form teams of 8 or less.